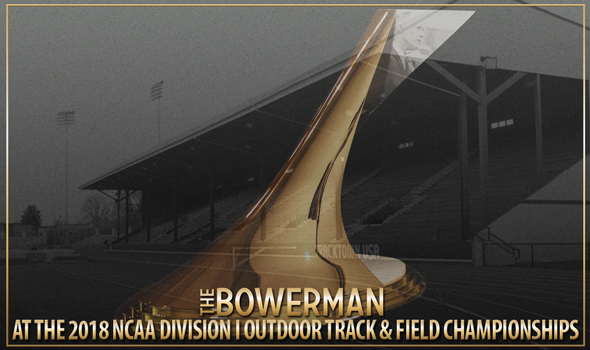 EUGENE, Oregon – Today is the final day that male collegiate track & field athletes can impress The Bowerman Watch List Committee. Following the conclusion of the 2018 NCAA Division I Outdoor Track & Field Championships, the Watch List will convene and pick the 10 semifinalist for collegiate track & field’s highest honor. Those names will be announced on Thursday, June 14 at 3 pm CT. But first, here is a look at what members of the last Watch List – the Pre-NCAA Outdoor Championships Watch List – have been up to in Eugene, Oregon. Remember: You can watch all of tonight’s action LIVE on ESPN beginning at 8:30 pm ET (5:30 pm PT).